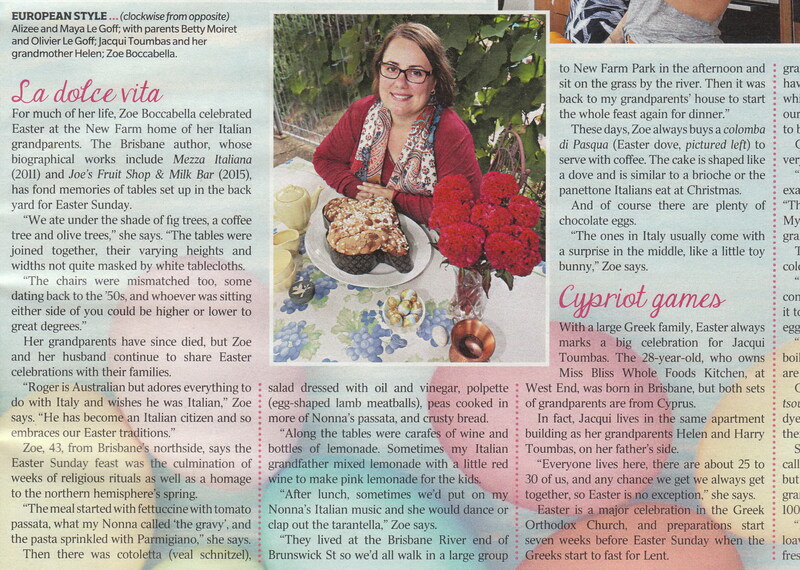 With Easter coming up, I was asked about my Italian family’s gatherings for part of an article in the latest issue of Brisbane News. In the photograph, I have in front of me a Colomba di Pasqua, an Easter dove cake similar to the Italian Christmas panettone. I also fondly recall Nanna Francesca making Pane di Pasqua, Easter bread, with whole eggs in their shells tucked among the plaited dough (the eggs became like hardboiled as the dough baked). By the way, to the left in the photo is her Sunflower coffee set, which I treasure. It is now almost 70 years old! Home-baked focaccia with rosemary from the garden and Australian-grown garlic and olive oil. Although I had a very brief knead of the dough, the credit all goes to Roger for this one. A lovely way to eat it is to make tramezzini by slicing the focaccia in half, spreading the inside of each piece with basil pesto and then for the filling, adding pieces of grilled haloumi, slices of barbecued eggplant marinated in olive oil, ripe tomatoes, a handful of rocket, roasted capsicum and thinly-sliced, roasted pumpkin.